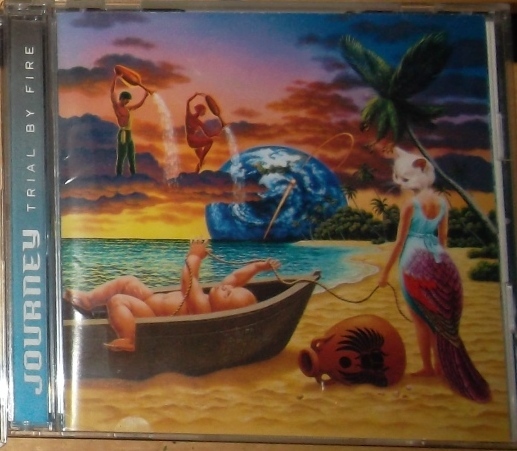 The classic Journey lineup (Steve Perry, Neal Schon, Ross Valory, Jonathan Cain, and Steve Smith) were back however briefly in 1996 with this triumphant reunion album. I remember in the store in 1996, nobody was buying it. How sad. This is among the very best Journey albums. In fact with Steve Perry’s voice showing a little more weathering and character, and the band having a more mature sound, I think it is the best. It’s a mellow journey, very much suited to Perry’s incredible pipes. The opening track, “Message of Love” storms across the speakers with Perry singing as powerfully as ever with Schon’s patented guitar melodies behind him. Cain tinkles at the ivories at precisely the right moments, while Smith demonstrates the timing and style that makes him a top jazz fusion drummer today. And that’s just the first song! The slower but equally powerful “One More” follows, and then we’re onto the first signature Perry ballad. “When You Love A Woman” was the single, but to me it’s filler. Much better is the ballad that follows it, “If He Should Break Your Heart”. “Don’t Be Down On Me Baby” demonstrates Perry’s soul roots. Whether on the ballads or the rockers, Perry nails every song perfect. If anybody else was singing on this Journey album, it wouldn’t have half the impact. As great as the songs are (and I believe they are a collection of Journey’s strongest ever), it is Perry that drives them home with his ballsy, epic delivery. I don’t want to bother listing all my favourite tunes. Basically all of them, with the exception of “When You Love A Woman” and the mid tempo rocker “Castles Burning”. Everything else is great, and distinct from one another. Each song inhabits its own space, style and sound. Yet it sounds like a cohesive whole, thanks to expert producer Kevin Shirley. And Steve Smith makes the ballads as smooth as butter. Just listen to “Still She Cries”. The Japanese bonus track is called “I Can See It In Your Eyes”, and is sequenced in the body of the album. This is a straightforward rocker, perhaps compensating for the lack thereof on the rest of the album. While not one of the better songs, it does have its place in appeasing those who think Trial By Fire is too soft. 4.75/5 stars. They should have toured. Ummmm,well for me I was fooled by this record,considering the other big reunions in 96 were the original dudes in KI$$ and the quick trip to the studio for Roth &Eddie for two quickie add ons to the greatest hits package for the mixed bag Roth/Hagar tracks…. I give Trial By Fire a 1……. Ki$$ cash grab You wanted the Best……1….Leno interview on the disc…-5….waste of time.. I don’t recall liking or disliking this especially when I first heard it but I’ll have to stick this back on to my listening pile! Perry’s Strange Medicine album was quite mellow and mature sounding and I LOVE that album so this sounds in the same kind of vein. Always great to see your comments gentlemen! There’s no denying it’s a mellow album. What can I say, this one clicks with me. I couldn’t tell you the names of any ballads Bon Jovi’s done in the last decade, nor how they go, but this one remains memorable to me. Having said that it was a bit of a flop so there you go. Don’t buy for over $6 — because it was a flop, used copies can be had for under that quite frequently. Deke I’ll have to review that Van Halen Best Of in the the future. I have two promo singles for the songs you mentioned and it would nice to get them up here on the LeBrain. Nothing wrong with mellow! I do love a good ballad and Steve Perry sings and writes them better than most. HMO ,I agree with u a good ballad is a good ballad ,but when a whole album is ballady and mid tempo at best esp Journey who had a lot of hype with this album….I mean check out Schons playing on the Hardline debut…..classic slab of AOR……. I haven’t heard the Hardline CD Deke. But I do know I prefer this album to any of the harder edge ones that came after it. Fair enough,I was just trying to spin some controversy on a Saturday night! Well I gotta say Deke that the Hardline CD is one I’ve had my eyes on for years. I knew a lot of people who loved that one. There’s another Journey side project to be aware of that was called The Storm — that one had Steve Smith, Ross Valory and Gregg Rollie. I may have to check that one out ….I remember reading about it yrs ago but it slid under the radar..thanks Mike…. Hey Deke, just curious since I’ve never been there, but what are the CD stores like where you are? Ok the CD is in the player… I’ve got the bonus track! Good times. Liking the first track, sounding a lot like Perry’s solo stuff but reminding me of Raised on Radio too (love that album!). Awesome guitar solo on this and I liked the guitar and vocal swells at the beginning too. Good start! Hope you don’t mind, but I’m gonna keep commenting while I listen! I’m 4 tracks in now and already sensing quality control problems. When You Love a Woman should have been taken off this. Two ballads in a row and the 2nd one is much better. I’m agreeing with you Mike on the album’s strong and weak points but I think I’m falling somewhere in between you and Deke on the album’s merits. I’m 8 tracks in and giving it a 3/5 so far. I think 1/5 is a bit harsh, there are some great moments on here but there’s something missing… it’s a bit lifeless at points. I love everybody’s perspective on this. You have me and Deke at both extremes and HMO in the middle. Now you said you had the bonus track? I’m wondering if it’s on European versions too. I’m not sure if it always was, I’ve got the 2006 reissue. Its got the track but it’s track 16 on my CD. Gotcha. They must have done a remaster of some kind. And there’s an unlisted reggae song on mine called Baby I’m Leaving You, do you have that too? I wondered about that not being listed on the back of your CD. That’s on mine – track 15. Not got to it yet though. Yo Mike ,as far as record stores here ,well it’s basically between Hmv and Walmart. Back 20 plus yrs ago….we had A&A,Sam the record man the usual probably about 15 or so stores plus local,places…..sadly they are extinct! This yr alone I have bought 2 actual cd’s…. Everything else has been a iTunes purchases…..
Yeah for sure good debates here….. Sad to hear that Deke! I love A&A’s, I spent many hours inside them. I guess you must have to download or buy discs online now. Yep for sure there is no where to go…I just purchase off of ITunes….. So let me ask you this Deke: Do you miss the physical format of buying music? Or do you prefer the convience of the instant download? Well yeah for sure I miss the physical copy,I mean like the rest of u guys I’m sure we all would stare at the credits ,artwork,lyrics,go back and stare again at the credits…..and so on…for hours on hours….. Instant download for convience is awesome ….like back in Feb I per ordered Halens Different Kind Of Truth….and we’ll I got it at 11 pm the day before its actual release…so needless to say it was a late night…hahahaha…..played that back to back twice before I went to sleep….so yeah they both have advantages/disadvantages as well…..
Nice getting ADKOT early Deke. I used to get early stuff at the record store something. Kiss Psycho Circus I had a full five days early. I listened to nothing-but the whole time. Hey, I went out to an art gallery with my girlfriend but I’m back now to resume my commentary! Starting on Colors of the Night and the albums picking up now I think. When I Think of You was a bit too cheesy but Easy to Fall and Can’t Tame the Lion have been great. Neal Schon seems more off the hook here than on Raised on Radio. He’s soloing all over the place and sounding on great form. Liking it. Digging Perry’s voice on this as well, I like the rougher edge in his voice. I’m glad we all have differing opinions for a change! What can I say? I sincerely really like Trial By Fire. Now my co-workers hated this record. Big time. They considered it a major downer album. But maybe that’s where my head was at, at the time. I do love Captured, too. I like a lot of records that no-one else likes! Captured is a great live album,Just The Same Way is a great track! This has been a great debate…..
You know what else I liked was Journey – Greatest Hits Live. I understand that the band were not happy with it, and much editing was done, but I think it’s a great car CD. Ok, I’m finished! There’s plenty of good stuff but it’s too patchy. The album picked up towards the end but that reggae track was pretty bad! Liked the bonus song. I would definitely listen to this again but I wouldn’t put it near their best. I give it a 3/5 if some tracks had been binned it might have made a 4. I certainly wouldn’t have called it a downer. As far as sales go, I think it might have seemed a bit dated when it was released, what do you think? Also, that cover is a howler… which wouldn’t have helped. The cover is certainly not great, which is a shame as I usually love their cover art! Maiden may not be as cut and dry as you might believe, my friend. Slap up them reviews and let the games begin. So you know, I have a rip of all the records here, and as you go, I will be listening. That way, I can fill my head with Maiden (never a bad thing), and I can intelligently comment along with the rest of you die-hards. Woo! For what it’s worth, from a guy who only knows Journey’s hits, I think it’s great fun for these sorts of conversations to take place. Mike’s comments secetion has almost become a forum on this subject. And how Journey, out of all the albums he’s slapped up here? It’s interesting, is all. I have nothing to add to your debate. I just had fun reading through it. Cheers, all.